Workers at the University of Texas at Austin began pulling down the campus’s multiple Confederate statues late Sunday night, ten days before classes are scheduled to begin. 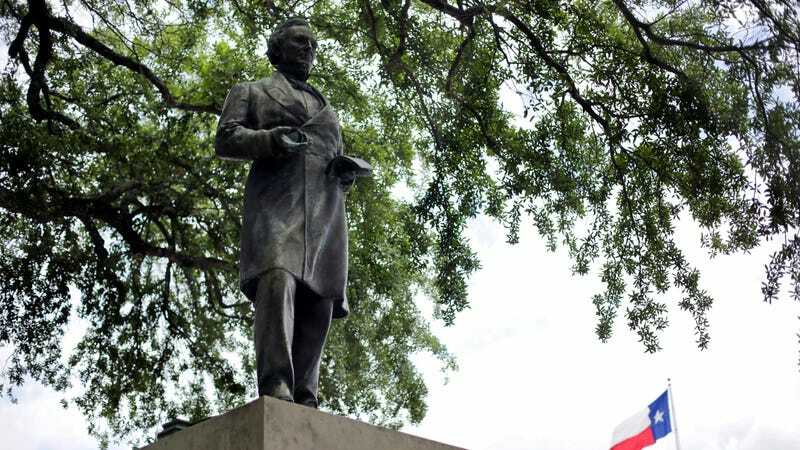 According to the Texas Tribune, University president Greg Fenves announced that three statues situated on the school’s grass mall—Robert E. Lee, Albert Sidney Johnston and John Reagan—were being removed, as they depict aspects of American history that “run counter to the university’s core values.” A statue of former Texas Governor James Stephen Hogg—the son of a Confederate general—will also be taken down. “Last week, the horrific displays of hatred at the University of Virginia and in Charlottesville shocked and saddened the nation. These events make it clear, now more than ever, that Confederate monuments have become symbols of modern white supremacy and neo-Nazism,” Fenves said in a statement. The statues will be relocated to the campus’s Briscoe Center for American History, though Hogg’s likeness “will be considered for re-installation at another campus site,” Fenves wrote. By far the most important thing to know about Hogg is that he named his daughter “Ima.” I’m serious. In 2015, the university moved a statue of former Confederate President Jefferson Davis from its home near the clock tower to the Briscoe Center. Davis had been a frequent target for vandalism, the Washington Post reports, and Fenves convened a task force to determine its future following the deadly rampage by white supremacist Dylann Roof in Charleston, South Carolina. It was ultimately decided the statue should come down. Each of the statues are expected to be gone by morning.